Also serving communities of Biscayne Park, Biscayne Park. There are 174 Assisted Living Facilities in the North Miami area, with 5 in North Miami and 169 nearby. The average cost of assisted living in North Miami is $1,500 per month. This is lower than the national median of $3,346. To help you with your search, browse the 376 reviews below for assisted living facilities in North Miami. On average, consumers rate assisted living in North Miami 4.0 out of 5 stars. Better rated regions include Miami Gardens with an average rating of 4.6 out of 5 stars. Caring.com has helped thousands of families find high-quality senior care. To speak with one of our Family Advisors about assisted living options and costs in North Miami, call (855) 863-8283. A suburban city about 10 miles from the heart of Miami, North Miami lies on Biscayne Bay and is home to the Biscayne Bay Campus of Florida International University and the North Miami campus of Johnson & Wales University. Seniors make up 10 percent of the population here and can choose from 11 assisted living facilities in the city or from 55 others in nearby towns such as North Miami Beach, Aventura and Miami Gardens. In Florida, homes with a standard license provide support and personal care for seniors who are still somewhat independent but could use help with daily activities such as getting dressed, moving around and taking baths. There is no state tax on income in Florida, and that includes retirement income like 401(k)s, pensions and SSI. There is, however, a 7 percent sales tax on most purchases. Miami-Dade County, home of North Miami, is a member of the AARP Network of Age-Friendly Communities, meaning its elected leadership "has made the commitment to actively work toward making their town, city or county a great place for people of all ages," according to AARP. The American Lung Association grades Miami-Dade County as a B for both high-ozone days and particle pollutants, which means that seniors with respiratory conditions shouldn't experience worsening symptoms due to North Miami's air quality. With 7.31 reports of violent crime per 1,000 residents per year, North Miami's crime rate is nearly double the national average. Property crime is also significantly higher in the city. North Miami's cost of living is right on par with the national average, and it's one of the more affordable areas in the Miami region. Health care costs are 8 percent higher than average, but housing is less costly. Expect long, hot and humid summers with average highs around 90 degrees. Winters are short and mild with average lows in the 60s. With frequent thunderstorms, North Miami gets about 50 percent more rainfall than the average U.S. city. Assisted Living costs in North Miami start around $1,500 per month on average, while the nationwide average cost of assisted living is $4,000 per month, according to the latest figures from Genworth’s Cost of Care Survey. It’s important to note that assisted living rates in North Miami and the surrounding suburbs can vary widely based on factors such as location, the level of care needed, apartment size and the types of amenities offered at each community. 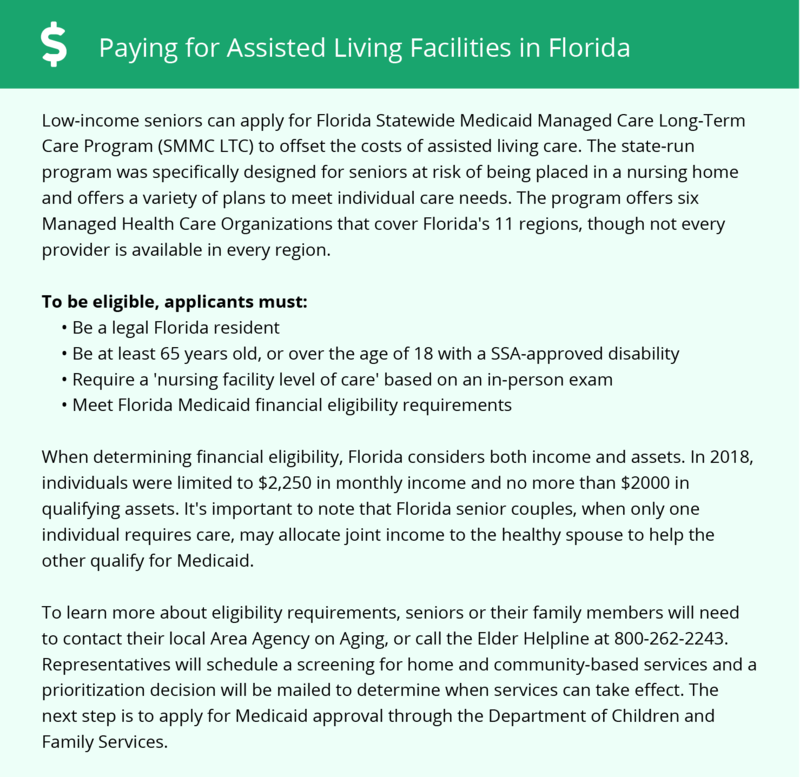 Florida provides optional state supplementation for seniors who receive Federal SSI benefits and lets families contribute to room and board at assisted living facilities without impacting a senior's Medicaid eligibility. Low-income seniors can also turn to Florida's Assistive Care Services and Medicaid Long-Term Care plans for help with the cost of services. North Miami and the surrounding area are home to numerous government agencies and non-profit organizations offering help for seniors searching for or currently residing in an assisted living community. These organizations can also provide assistance in a number of other eldercare services such as geriatric care management, elder law advice, estate planning, finding home care and health and wellness programs. To see a list of free assisted living resources in North Miami, please visit our Assisted Living in Florida page. North Miami-area assisted living communities must adhere to the comprehensive set of state laws and regulations that all assisted living communities in Florida are required to follow. Visit our Assisted Living in Florida page for more information about these laws.